My morning began with a quick stop at the gas station before heading to IKEA with the girls for some long-overdue Christmas returns. As I was coming around the corner of the building, another girl came flying around the corner towards me. I had to swerve a bit to miss her which caused me to slam my right front tire into a cement curb. When I stopped to get gas, I checked the tire, which is now sporting a 50-cent piece sized bulge. Perfect. A consult from my dad and then the tire store shows that I now need a new tire. ugh. I was on the cell phone with Dan, driving to the tire store, practically in tears over the frustration of this kind of annoying spending, my children were fighting and screaming in the back seat over a bag of pretzels, almost coming to blows. It was one of those pull-your-hair-out mother moments. So anyway, plans were changed. No IKEA until the tire gets fixed. I don’t think I’ll risk a blowout on the highway with my two girls in the back and little babe in my belly. I’m sure I’m being overly cautious, but it’s not worth the 99 cent kid lunches in IKEA’s relaxing cafe. Oh, and these two are still at it, pretending to give each other shots. I overheard the one pretending to be "Molly" say, "Get it out of me!". C’mon. Do I really say that??!! I can’t believe it. Maybe during labor, but not during shots. Where do they come up with this stuff? Oh dear, what a rough day. I am glad you are all safe. Frustrating to have to replace tires. As for your “Pull-your-hair-out Mother moments”, you are not alone. We all have days like that. Sometimes it helps to know you aren’t alone. Here’s to a better day tomorrow! I did something similar only I gashed it and the tyre went flat straight away.Luckily there was somewhere I could pull over and hubby had to come and rescue me in the pouring rain.IKEA lunches are def not worth the risk!I thought we got good deals at 99 pence but 99 cent is half that! Hope Madeline enjoys here bath and I love the Flickr photo of the shots! I’ve just recently discovered your blog. The bit about the lost doll makes me think of a book I read entitled “The Most Wonderful Doll in the World”. It was written in 1951 so it’s a bit dated. It might be a fun read aloud. The girl in the story has an over zealous imagination about a lost doll. When she finally finds the doll her fib (imagination) is revealed. Just the other day my 3 year old said to me as I hesitated to speak “just spit it out mommy”. She must have heard it from me. I told Brian one day, “It’s all I can do sometimes not to drive this wagon off a cliff.” You should have seen the look on his face. Sorry your day has been so crummy. I hate getting new tires. Why can’t the old ones last forever? Not worth it for sure…and glad you have a couple of doctors in the house to fix up the sweet dolly. I’ve driven into the curb too – mine punctured straight away. Had to spend $150 on a new tyre, right when we didn’t have any spare cash. Always comes at the worst of times.As for Madeline, there is a Canesten laundry detergent specifically for attacking mould. Could be just the thing for you. Also, vinegar will kill it, and a good day’s sunbaking. If it makes you feel better, Fatty took one look at my tires and told me they all need to go. Looks like I am headed to the tire shop first thing in the morning…I will be thinking of you! Madeline RX: I can’t say enough good things about Oxo Brite, also – a la cloth diapers, you might try an application of Bac Out and setting her out in the sun, I know, know what sun? 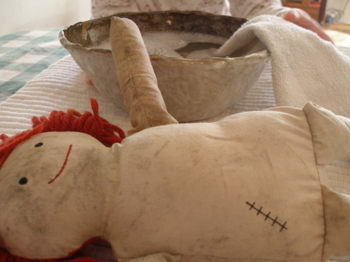 I had to do surgery to a Kathe Krusse doll that had a bath, the stuffing was a mix of sand and lavender, I did not think that would survive or really dry, ever. Good luck! Ahh, ehem. “get it out of me!” That is exactly what you said to me when I was giving you the shot last weekend!! Sorry about your tire. We had to fix our dishwasher a couple of months ago and I was sick about it! All these weird charges suddenly come out of the woodwork, I hate it when that happens! I was going to suggest Oxi-clean . . . but I don’t know if you have that in Australia. (Isn’t that where you are?) Maybe bleach. I hear you on the kids!! Sometimes I just wish that there was a magic sleeping pill that we could give them. They are so cute when they are asleep!! LOL! Oh, wait. I was just checking out your shop (cute stuff!!!!) and I see that maybe you are in the U.S. Woops! Yep, I’m totally with you with those unexpected road trip problems. I was driving to the fabric store Thursday because I just opened the box I received days before for the craft project we were doing at the retreat this past weekend and half my order was backordered. I hadn’t bothered to check it earlier, so off to the store last minute. As I was driving to the store a truck threw up a large rock and hit my windshield, causing a crack now in my line of view. I was soo mad because I was leaving this weekend with the van for a long road trip to the retreat with the ladies. I guess we’ll just wait until spring to replace it though.